Congratulations to the newly initiated! 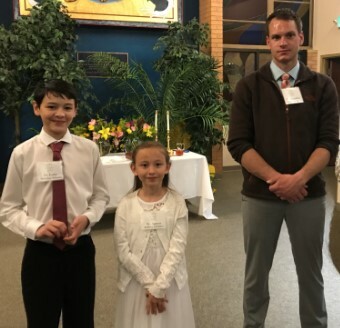 During the Easter Vigil three new members were fully initiated through the waters of Baptism, fed with the Eucharist and Confirmed in Christ. Please join us in welcoming Audrey Schmitz, Nicholas Schmitz and Cameron Leben. 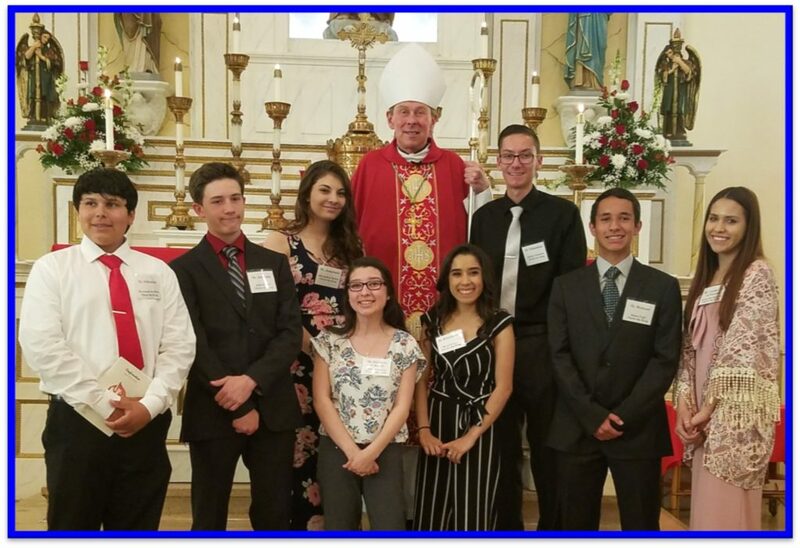 See more photos in the parish bulletin. Fr. Bill Gleeson has passed away…. Fr. 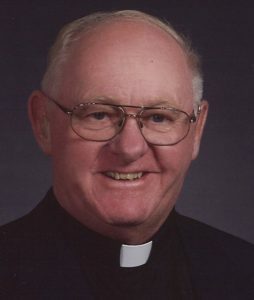 Bill Gleeson passed away unexpectedly at his home on February 7, 2018. Please keep him and his family in your prayers. Fr. Bill was our beloved pastor from 1985 – 1995. 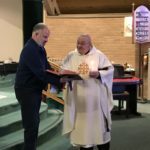 He substituted at Mass many times in the past few years. We will truly miss him. Click here to read more about Fr. Bill on our History page. 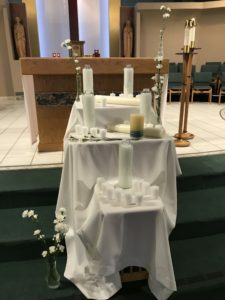 A Mass of Christian Burial was celebrated on Tuesday, February 13 at 10 a.m. at Sacred Heart Cathedral, with burial rites at Roselawn Cemetery, Pueblo, CO.
Who cares about Groundhog Day! It’s Candlemas! 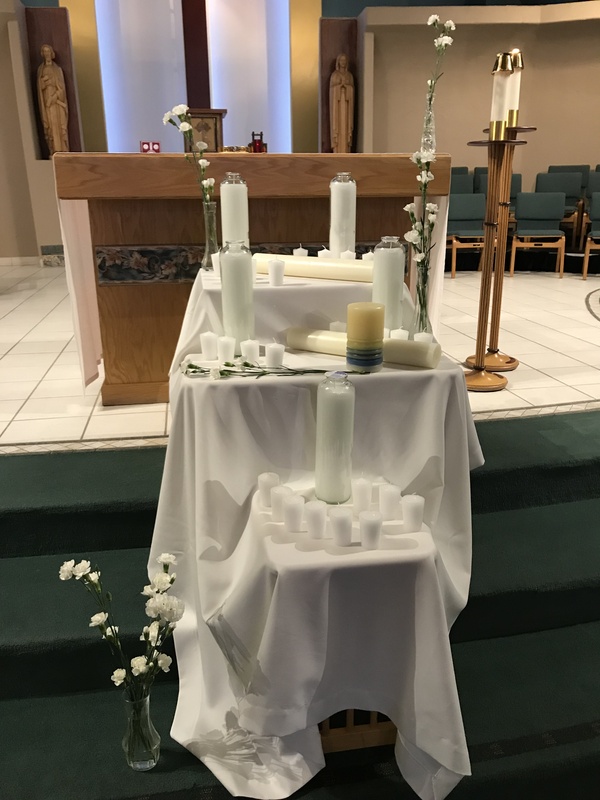 This morning approximately 30 people gathered with candles which were blessed by Fr. John! Who cares about Groundhog Day! It’s Candlemas! On February 2, forty days after Christmas, we celebrate Candlemas, the midpoint of the Winter quarter. This feast celebrates when Mary and Joseph took the infant Jesus to the Temple to be presented to the Lord, as Jewish Law required. When they walked in, they were greeted by Simeon and Anna; God promised them they would live to see the Messiah. They prophesied that Jesus would not only be the Messiah to save the Jewish people, but the Savior for all the people of the world. In Simeon’s words, Jesus would be “a light for revelation to the Gentiles, and glory for your people Israel.” Good News for all of us who aren’t Jewish – we, too, will be saved. Because this Feast emphasizes the Light of Christ, on this day the church blesses candles and the Assembly carries candles in procession. Please see our Facebook page for more photos taken this morning. How do we talk to our teens, children and adults about tragedy? There was a terrible tragedy in Las Vegas on Sunday night, right on the heels of three terrible hurricanes that have devastated the lives of thousands of our citizens. 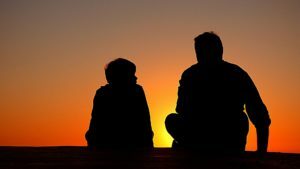 How do we talk with children about these things? The following link has an excellent article about just this. While it focuses on teens, most of the suggestions would be good for smaller children and adults as well. We believe it is worth a read. 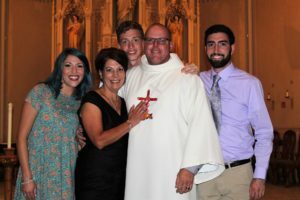 Welcome Deacon Corey Compton and his wife, Louise, to the parish! 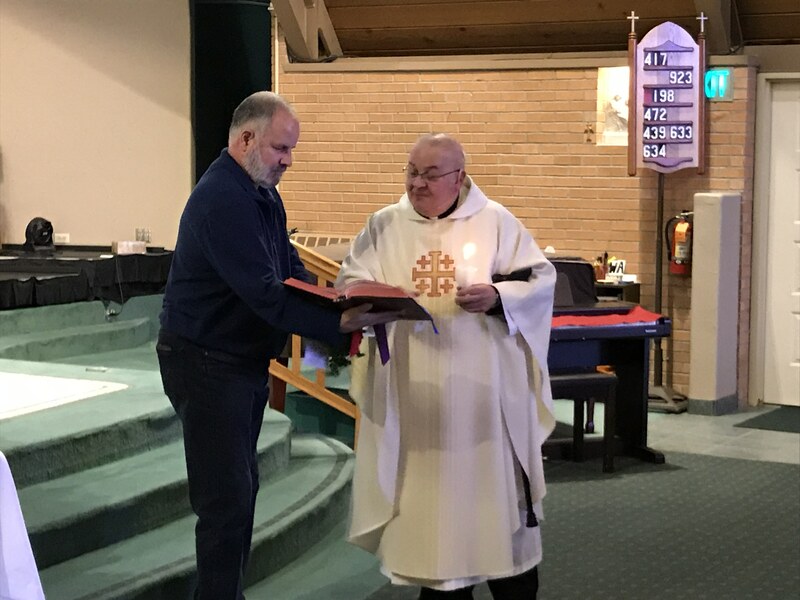 We are happy to announce that Deacon Corey Compton has joined our Parish Staff. We now have two Deacons available! Learn more about Deacon Corey and his family in the bulletin.